What is the San Francisco Dungeon? Do you have strobe lighting? What is inside the San Francisco Dungeon? What's happening at the San Francisco Dungeon? How long does it take to go around the San Francisco Dungeon? How does the San Francisco Dungeon work? What happens if a member of our party suffers with Motion Sickness? Are there any restrictions for Pregnant Guests? How long can I expect to wait in line to get into the San Francisco Dungeon? Do you have crowd control measures in place? Which items cannot be taken into the San Francisco Dungeon? Do you have luggage facilities? Can I bring a stroller or buggy on the tour? Can I leave my stroller or belongings somewhere whilst I do the tour? Where do I find my photograph code to enter online? Can I take a camera into the San Francisco Dungeon? Can I buy photographs at the San Francisco Dungeon? Are there official the San Francisco Dungeon Photographs? Can I film or video during my visit to the San Francisco Dungeon? 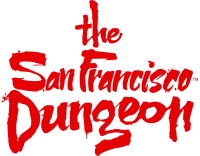 What characters are there at the San Francisco Dungeon? Will the actors touch me? Do you have animals at the San Francisco Dungeon? What is your latest attraction? What is The Descent area of the attraction? What is The Gold Rush Greed area of the attraction? What is The Lost Mines of Sutter's Mill area of the attraction? What is the Gangs of San Francisco area of the attraction? What is The Court Room of San Francisco area of the attraction?